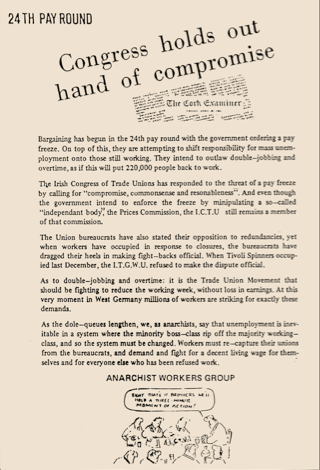 The Cork Anarchist Workers Group was set up in early 1984 and became the Cork branch of the Workers Solidarity Movement when the WSM was formed later that year. Their leaflet about that year’s pay negotiations could have been written today, when it noted the Irish Congress of Trade Unions response to a threatened pay freeze was a call for “compromise, commonsense and reasonableness”. Members included industrial chemist turned author Kevin Doyle and Clonakilty anti-war campaigner Dominic Carroll. 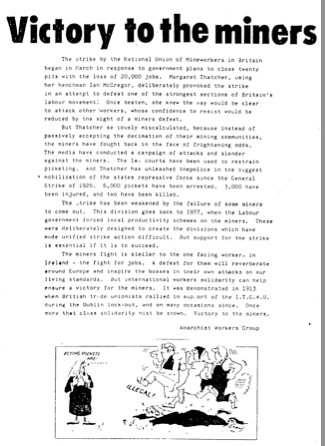 The first issue of Workers Solidarity was published in November 1984, a few weeks after a small group of anarchists from Cork and Dublin had founded the Workers Solidarity Movement. Initially an 8 page A4 monthly, it later appeared as a 20 page magazine, then a 12 page A3 newspaper and currently as a folded A2 paper. Circulation in their first years ranged from 750 to 1,500. Sales were mostly in pubs on Friday evenings, street sales on Saturday afternoons, outside labour exchanges (the biggest regular sale was at the women’s labour in Cork), and at left events. The WSM is part of the ‘platformist’ current within anarchism, http://anarchistplatform.wordpress.com. As befits a first issue, there is an article setting out the politics of the WSM. 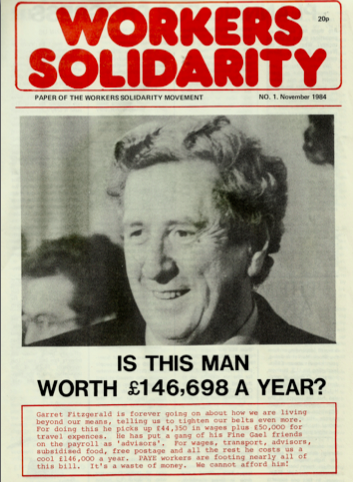 Others look at the British miners strike, free trade unions in Russia, the Dunnes Stores anti-apartheid strike, how the government managed to cut some some women’s dole payments while conceding equality, the connection between socialism and freedom, and the campaign for conjugal rights by anarchist prisoners Marie and Noel Murray. The manic looking guy on page 4 is Dessie O’Malley, then Fianna Fail minister and later the leader of the Progressive Democrats. Dessie was very worried about “industrial subversives” at the time. Also of note is a letter from Poland and an advert for a WSM picket protesting about the Polish government’s export of coal to Britain during the miners’ strike.